DEARBORN HEIGHTS, Mich. - State and local police are investigating after two men, including a police officer, were found dead Friday in the garage of a home in Dearborn Heights, Michigan. 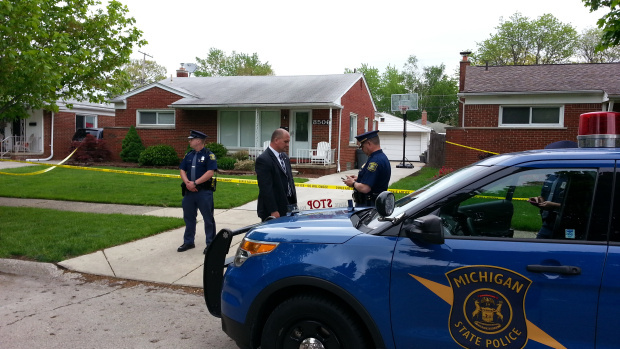 Officers crowded the scene at the home where the bodies were found, shortly before 9:30 a.m, reports CBS Detroit. Police confirmed that one of the dead was an officer in Dearborn Heights, a city in the Detroit metropolitan area, but did not immediately provide any further information about the victims. One woman, who lives across the street, said word about the situation was spreading through the neighborhood. "I found out that there were two bodies in the garage, but didn't know who they were at first," said the woman, who didn't want CBS Detroit to use her name. "Someone talked to someone -- you know how that goes -- and found out that it was the boyfriend of the woman that lives in the house and a friend...a Dearborn Heights police officer."